A product design concept produced in conjunction with Seth Kranzler. 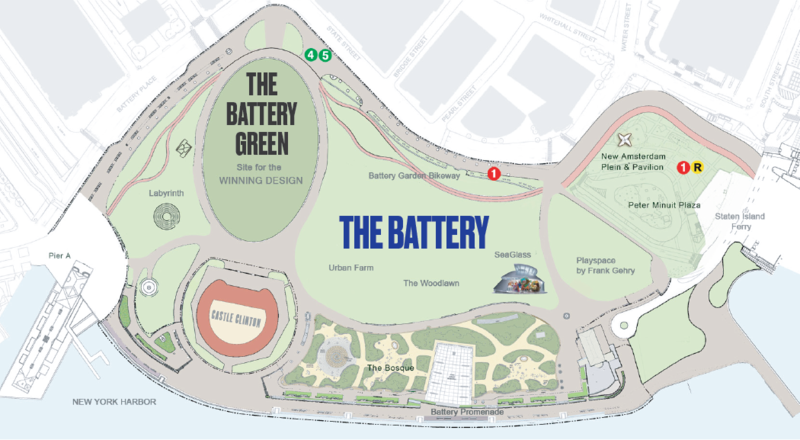 In the fall of 2012, my good friend Seth Kranzler—who I had met at SVA’s summer product design intensive in France—got in touch asking if I’d be willing to team up on designing a chair for a competition that The Battery Conservancy was holding for the soon-to-be redesigned Battery Park. Neither of us had designed a chair before (Seth’s an engineer and I’m a graphic designer), but we decided to have a go. Our desire to create something especially for Battery Park led us to examine many aspects of the area, including the history of the park as well as the usage patterns of park patrons. 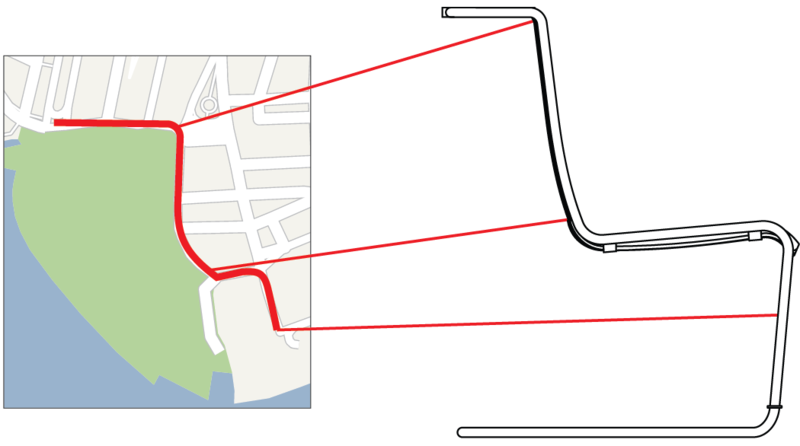 In the end, it was a map that gave us our answer—the side profile of our chair is taken directly from the outline of the streets surrounding Battery Park. Either as a single unit for a weary tourist, or when ganged up for special events, this silhouette proves to be simple, novel and practical all at once. The southwestern portion of State Street provided influence for a backing that is both comfortable and supportive, while contours of Battery Place inspired the small shelf at the back, on which one could rest a purse, drink, or a small snack while taking in the park. Battery Park proves to be a very versatile geography indeed. Throughout the design process, manufacturability was a core requirement. Given Seth’s background as an engineer, all aspects were looked at from a practical standpoint, particularly in regard to his past experience with tubular vehicle chassis design. Thus, an 18-8 grade stainless steel was spec’ed for the tubular frame. While more costly than plain steel, this selection requires simple finishing, and will not rust or require frequent painting like steel. The seat & shelf slats were specified as recycled polyethylene lumber made from recycled milk jugs; this material would be both cost effective and extremely resistant to the elements. Additionally, both the polyethylene sheet and stainless steel are nearly graffiti proof, further reducing maintenance costs. 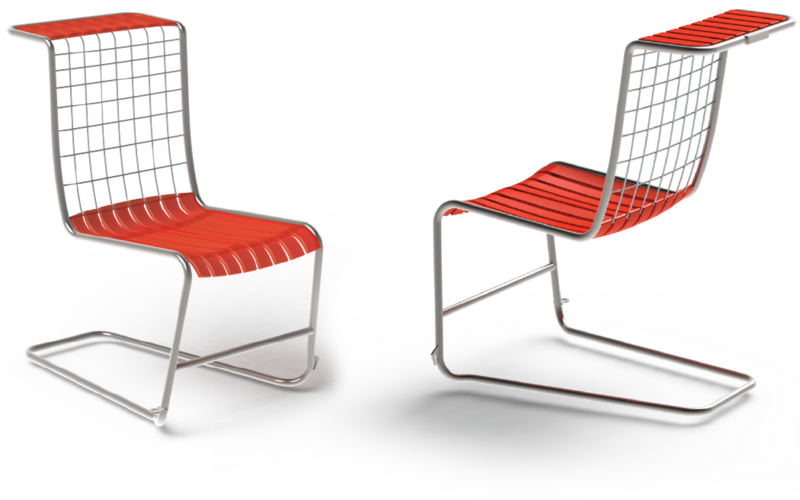 The chair also features a system that allows it to be ganged up into as many different configurations as is required, whether it be a simple group of two for a couple wandering in the park, or into rows of forty for a live event. 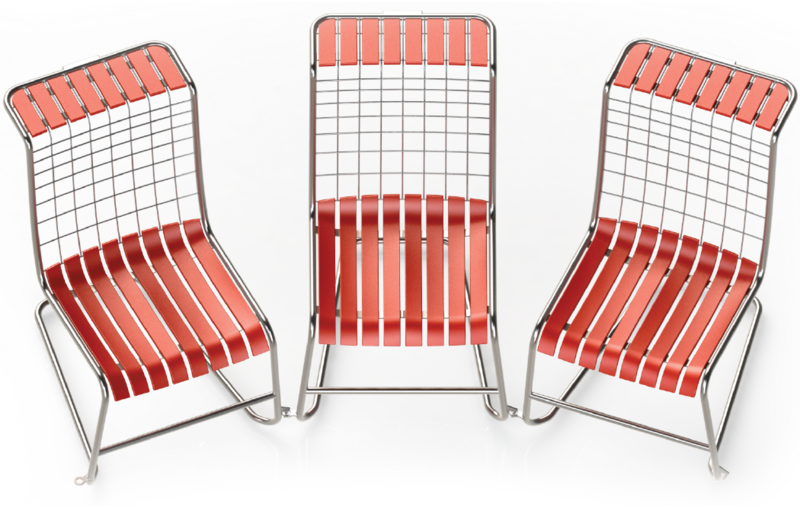 The ganging system also allows for chairs that are linked to still be rotated, thus not restricting their placement as other linking systems tend to do. As residents of New York City, we feel that the final product engenders a sense of community, sustainability, and interactivity that would be beneficial to the new Battery Green, and reflect the nature of what a park should be in the 21st century.